It was a good day for the Bowling Green Hot Rods, who got a great pitching performance from Henry Centeno, rallied late for a win against the Great Lakes Loons, and saw one of their most highly-touted alumni, Blake Snell, make his major-league debut Saturday. Centeno got a no-decision in Bowling Green’s 7-3 win at Dow Diamond, but pitched a perfect game until Great Lakes broke it up with a Nick Dean single to lead off the 6th inning. Centeno gave up another single and a walk before he was removed from the game, finishing with this pitching line: 5 IP, 2 H, 1 ER, 1 BB, 8 K. The righty hadn’t given up a run in his previous three starts this season. The Loons rallied for two runs in the 7th to tie the score 3-3, but the Hot Rods plated four in the top of the 9th to win. Reliever Ian Gibaut (1-0) got the win after striking out three batters in 1.2 perfect innings. Loons starting pitcher Victor Gonzalez gave up three runs on five hits and two walks in five innings. He struck out eight batters and threw a wild pitch. 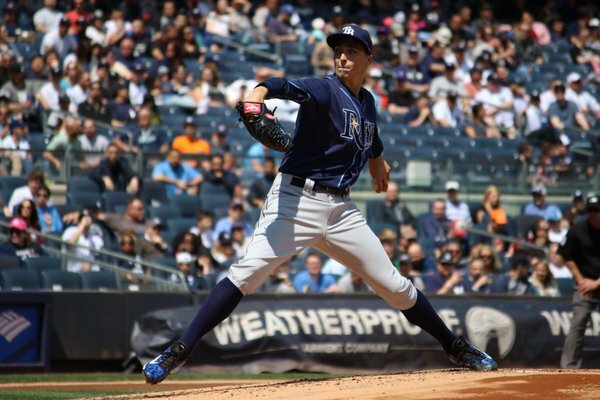 Meanwhile in New York, Snell got a no-decision in his impressive MLB debut for the Tampa Bay Rays. He gave up one run on two hits and a walk in five innings. He struck out six batters and threw two wild pitches in front of a crowd of 40,714. Snell made 31 starts for the 2013-14 Hot Rods, which I recently wrote about here. Snell’s brother Tyler was seen on TV wearing a Hot Rods cap while watching Blake pitch at Yankee Stadium. This entry was posted in Bowling Green Hot Rods, Great Lakes Loons, Midwest League. Bookmark the permalink.